Somehow time seems to fly by even though we're basically just sitting here at the marina in Green Cove Springs. At the end of the day we often have trouble remembering how we spent it, but have felt busy all day. Carolyn Ann has gotten a good cleaning inside and out. We've continued to enjoy visiting with boaters that come and go. 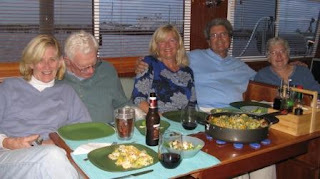 Linda and Fred Mangelsdorf arrived on Young America and joined us, with Linda and Mike Borum (Sea Dream) for dinner. Since we still had a car here, we drove Fred and Linda down to Orlando to retrieve their car - which ended up there due to a convoluted set of circumstances. One thing we're all learning is to be flexible with plans! I had a birthday this month and my gift from Joe was a pulley system for the television - an idea borrowed from Young America. Thanks Fred!Now I can raise and lower the tv myself. So many smart people own these boats. We hear Bruce (Forever 39) has come up with a mechanical counter to keep track of how much anchor line is out. These are not things I ever would have expected to be excited about! One of the reasons for our delay has been the completion of built in steps on each side of the bed. Those of you who have been on the boat will remember that even those of normal height would have trouble getting up on the bed. Part of the installation included new doors for two cabinets - the doors had to be smaller than the original ones. 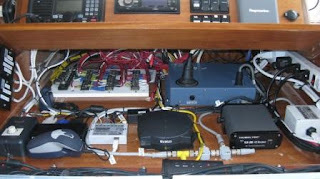 Sounds easy enough, except that the wood in our boat is mahogany and Mirage is now using cherry. Eventually, suitable wood was located, doors made and installed. They turned out great! So while Joe and I were busy watching the various workers on the boat, what was Rocky up to? 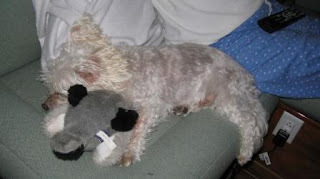 Our ever vigilant watch dog wore himself out protecting us from a stuffed goose. Finally everything was done, we'd had "farewell cocktails" with Brooke and Dee on East Passage along with Mike and Linda from Sea Dream. The plan was to leave Saturday morning, April 4. I woke up early Saturday morning feeling anxious. When Joe got up, I told him that I needed to go back to Pensacola before we left. John and Meredith had closed up the house for us - following a detailed check-list. Unfortunately, I had little faith in the check-list. I needed closure! So, Joe, Rocky and I took off with an audio book, tidied up a few things at the house and returned the next day. Monday we left the dock with a good(?) deal of wind (30-40mph) and started north on the St. John's River. Mike and Linda (Sea Dream) had planned to join us but were on the wrong side of the pier - the wind had them pinned. 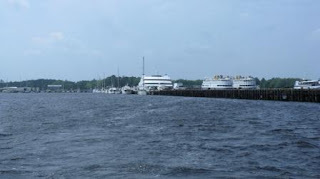 After a night at Jax Landing with two for one Margaritas, we're headed north and are on a mooring in Fernandina. Tomorrow to Brunswick to visit friends and a hair cut for Punk!